The recent death of my friend Arkadii Dragomoschenko on September 12, 2012 made me want to reprint these two days of my trip to the then Soviet Union for the Leningrad Jazz Festival, where we had a great time with Arkadii. One of the great treats of traveling with a jazz group was that every night I got to hear wonderful music. I never grew tired of the ROVA group, as I came to know some of their works quite well. The first few days, moreover, occurred during the Leningrad Jazz Festival, featuring many of the top talents from around the world. The Festival was held on an island, which required one to cross a drawbridge, which led, the first night, to my roommate being home long after midnight. The ship was trapped under the bridge! I attended the second day, truly enjoying the vast array of talent. One young Soviet saxophonist-violinist was particularly appealing, I recall, but now, some 21 years later, it is hard to remember any the performances I witnessed. I believe I saw Viatcheslav Nazarov, the noted Russian jazz trombonist, as well as the Leningrad Dixieland Jazz Band. I vaguely remember that there was one group called "Africa," which featured only white players, but seemed an appropriate name nonetheless, celebrating the roots of jazz. Arkadii Dragomoschenko later told me that there a great many singers and groups in the Soviet Union who had taken on that moniker. From time to time, I went to the nearby green room, which had a small café, and where figures from all the arts gathered to talk. Whenever my friend, Arkadii, decided to visit the café he simply got up and walked across the stage instead of retreating through the back of the vast auditorium. It was his way of speaking out, I believe, against the authoritarian way of life in the Soviet Union, a kind a swagger, as if to say, "I'll go wherever I damn please." I always chose the long route. At the café, Arkadii introduced me to several young poets and to two young curators, husband and wife, who were planning a large international retrospective of contemporary artists. When I told them of my companion, Howard's involvement with art, they immediately responded, "Oh yes, we know of him. We have his Robert Longo catalogue. Yes, we want definitely to include Robert Longo in our show." I grew interested, and we discussed several other artists they hoped to include, often asking me what these people were like to work with. "That, I wouldn't know, except for hearsay. Robert, I believe, is usually a sweetheart." After a while, I asked them what they were thinking of calling their show. Both quickly responded: "AF-ri-ka," emphasizing the first syllable. "Africa?" I queried. But you've named no African artists in your show, not even any Blacks!" "Oh, but you see, it is a world of pristine beauty. Of perfection. Of innocence. That's what we want." "Oh dear," I pondered. "When I think of Africa, I think of all the destruction of land and cities caused by Western investments. I think of great poverty, of diminishing wilderness. Yes, I am sure there is much beauty in Africa, particularly in the protected parks and isolated sections, but so many scenes in photographs and films show ramshackle huts and tin-built canteens, crumbling cities. But then, I've never been there." "Nor we! But I am sure it is beautiful," insisted the male. "It is as close to heaven as one can get," added his wife. I smiled painfully. How to you argue against such a wonderful illusion? Given their own polluted rivers, rusting industrial complexes, they needed to believe that such beauty might exist somewhere, just as I had had to look elsewhere when faced with my childhood of suburban burger and pizza stands and chain shopping outlets. Despite the apparent restriction of Soviet tourist hotels for Russian citizens, poet-friend Arkadii Dragomoschenko joined us each day at dinner in the hotel dining room. His company was a joyful one, and he kept us abreast of Russian events and traditions. Clark Coolidge, Lyn, and I talked with Arkadii everyday on various subjects. I particularly remember when the conversation turned to Women's Liberation, which was dismissed out of hand by both Arkadii and his wife, Zina. "We want to be pampered and not have to work," she declared. Near the end of our stay, Arkadii invited us to a party at his son's art studio/apartment. The dilapidated space was like something out of the 1920s and 1930s collective housing, a place shared by four or five artists, each occupying a small corner. I recall a woman artist having only a small walking passage, a couple of artists sharing what might one day have been a bedroom. Ostap shared the so-called "living-room." Several of his paintings had been tacked to the walls. Each of us, as expected, had purchased vodka and other foods (chips and candies) from the tourist shops, where, once again, Russian citizens were not permitted. Zina had made a dish of chicken drums and wings soaked for days in a hot vinegar sauce, and served cold. The huge bowl of chicken, most of us realized, must have taken her several days, working with other women friends, to accumulate from the almost-always empty food stores. If it was not the best food I had ever consumed, it was, nonetheless, a veritable feast, given her few resources. 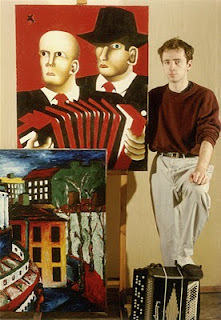 Ostap was a handsome young man, proud of his slightly abstracted figures on canvas. 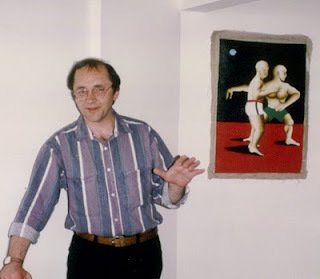 I was particularly taken by the brightly colored painting of two beefy wrestlers, and when I expressed my appreciation of the work, the artist immediately took it down from the wall, rolled it up, and handed it to me as a gift. I tried to pay for it, but he refused. Today, after these many years, it still hangs in my offices, tacked to the walls as it originally was, in his studio. The evening was absolutely splendid, but I could not help but feel some sorrow for these young artists, who lived perhaps not so differently from young New York artists in frigid, walk-up lofts in the early 1950s. But each of their spaces was so tiny it seemed that one might become claustrophobic if they all turned up on the same day to work. Perhaps they had planned it out that they would paint, draw, or sculpt at different times during the week. Yet they all seemed excited and proud to be able to show their art to a new audience whom we represented. Several works were purchased by members of our group. It was, in short, one of the most joyous evenings of our stay in Leningrad. Reprinted from Green Integer Blog (March 2010).